Sports at Tech are not only restricted to watching the Yellow Jackets play at Bobby Dodd stadium or the many Division 1 Varsity sports, as many students get involved with club sports, which are teams put together by student leaders to compete against other colleges. These club sports are more relaxed and flexible than Division 1 sports, but much more competitive than intramural sports. This is often the happy medium for students who want sports to work around their school schedule, but are still passionate about continuing their athletic skills through their college career. At Tech, club sports range from Ballroom Dancing to Airsoft, and many students take advantage of this great opportunity to continue with a sport they love or learn a new one. Presently, tennis is in the national spotlight as all the elite professional players gather in New York City in the Billie Jean King National Tennis Center for the last Grand Slam Tournament of the year. Tech’s Club Tennis team is also expanding. Tryouts for new members for the team occurred this past week and were very competitive, with many talented players giving their all. Although many more men than women came to try out, the overall acceptance rate is generally the same. Based on previous years, only about 10 to 15 percent of the 130 athletes that try out were expected to make the team. “These athletes played competitively with their high school teams, as well as participated in Junior USTA tournaments,” said President of the Tennis Club, Nick Christie. Athletes of all skill levels, ranging from high school varsity to NCAA Division 1, participate in the team and bring a broad range of experiences, allowing each individual to better themselves at their own pace, meeting their indivudual goals. These tryouts and future practices take place in the new Bill Moore Tennis Center, which the Tennis Club has only been able to use since the end of last semester. Like numerous club sports at Tech, practices occur three days a week and involve working on drills, point play and conditioning. However, their inherently relaxed nature, in comparison to Varsity sports, is ideal for students who still want to focus decent attention on classes, social events and other campus involvement. The team also attempts to form their own social community and participates in outside activities such as tailgating at football games. The Tennis Club is only about 10 years old, but this comes with perks. The team shares courts with the Varsity tennis team, but still maintains a good relationship with the coaches and work around their schedule, practicing at night after the Varsity team’s day practices. For many students who miss their intense athletic schedules from high school but opted out of playing in college, club sports are the perfect opportunity to remain competitive and balance time. The Tennis Club plays in approximately five or six big tournaments in the fall; additionally, they compete against other colleges in about five head-to-heads, traveling to places such as Auburn and Hilton Head. The team has many opportunities to travel to different states and cities for competition, which is cited by many students as a great way to get to know their team as well as understand the culture of the same sport across different college campuses and areas. For each larger tournament, the club only sends one or two top teams; alternatively, for local tournaments, more players get a chance to represent Tech as the team typically sends three full teams. One of the team’s larger accomplishments was at the USTA Southern Sectional championship, placing 12th in the nation. Each team at these competitions is composed of six men and six women, chosen based on rankings within the club. Having the chance to play at more competitive events throughout the school year also provides motivation and incentive for players to improve themselves and work together as a team to better each other. The club also focuses on growing and evolving, hosting tryouts both in the fall and spring semesters. Having a strong roster is crucial to expanding the range of teams willing to schedule matches with the club team. “Our competition schedule depends on our performance in the fall, but we compete in more head-to-heads, as well as Sectionals and Nationals,” said club Vice President Erik Lobben. 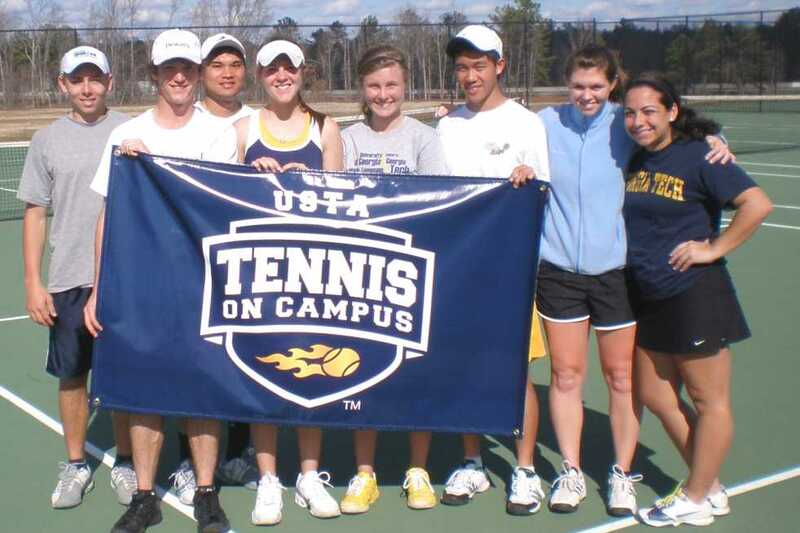 It is well known that the Varsity tennis teams at Tech, both men’s and women’s, are exceptionally driven athletes. In the few weeks since fall has started, the women’s team has already won the doubles title at the 2013 ITA National Collegiate Summer Circuit Championships which was held Aug. 10-13 and the men have come up with a strong team for their season. According to the CRC, for students who want to continue playing sports that interest them, or simply want a new involvement that is fun and healthy, club sports are an excellent way to stay active and enjoy competition. A lot of students tend to have cherished the team bonding and experiences of high school sports, and feel that they miss that feeling of identity in college. Keeping that sense of collectivism as a team is important for many, and does not have to be lost in everything else that college offers. The CRC website has information about club sports and meeting or practice times, and a few are active on social media. Many club teams also focus on advertising via mass emails or through chalking along Tech Walkway or around the freshman dorms. With 33 sports clubs at Tech, there is an outlet for everyone.